Who's got two thumbs and had an exclusive photo shoot with the one and only Rarity? I've got no idea, but I'm freaking jealous of them. She's like... the pony everypony should know! 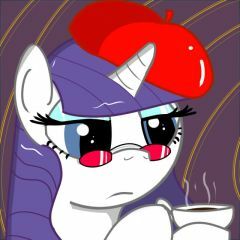 This Rarity avatar is free to use by anyone. Once again glasses are the best thing ever, and Rarity makes those rose daddy-o shades look sooooo smooth.